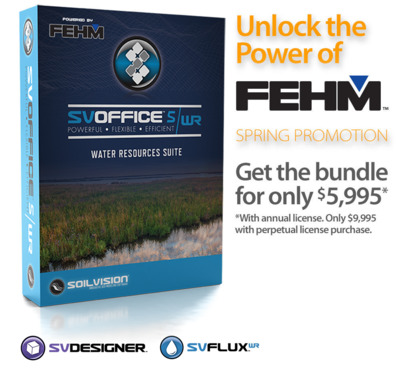 SVOFFICE™5/WR integrates the front-end of our acclaimed numerical analysis software with the powerful FEHM Control Volume Finite Element solution engine.Users can leverage SVFLUX™WR capabilities such as double porosity / double permeability to simulate realistic and detailed analyses such as fracture flow. This package provides market leading site conceptualization and 3D meshing of detailed geostrata including layer pinchouts.In combination with SVDESIGNER™, hydrogeologists can fully visualize groundwater-flow of large-scale, thin layer regional models easier and faster than previously possible. With the addition of SVHEAT™WR, the simulation of heat conduction and heat convection in porous media, simulation of heat transfer in both saturated and unsaturated media, and the simulation of non-isothermal multiphase flow of water and vapor in porous media is also possible. SVFLUX™WR and SVHEAT™WR can be fully coupled for seepage and heat-flow solutions of nonlinear equations using implicit Newton Raphson Method. The following definitions serve to clarify the various authorization levels which can be enabled for our software packages within the SVOFFICE™ suite. STUDENT This is intended to be an evaluation-level authorization. This is the default (free) authorization level which is enabled when the software is first installed. Models can be opened and viewed but cannot be saved unless they are simple enough to meet the definition of a “student version” model. The STUDENT authorization level is designed to allow university students to solve simple numerical models for educational purposes. The STUDENT authorization level can also be utilized for evaluation of the software by consultants but cannot be utilized on consulting projects. CLASSROOM authorization level is designed for professors wanting to authorize a group of students at the undergraduate or graduate level for instructional and teaching purposes. This version authorizes a STANDARD version of the SVSLOPE® software and a STANDARD version of all other finite element packages with a 2D cell limitation of 400. STANDARD authorization level provides the most basic level authorization for a purchased version of the software. Mainstream features for this type of software are enabled. This version is intended for budget conscious users. PRO authorization level provides more advanced research level features which are typically only available in the SVOFFICE™ suite of products. The professional version is required in order to do full coupling between software products. The MINING authorization level provides for the rapid deployment of the very latest and cutting-edge features which are available in no other software package. This authorization level is typically reserved for the discerning user that wants it all. PERPETUAL – An outright ownership of the software purchased. ANNUAL LEASE - A one-year authorization of the software purchased. SEMI-ANNUAL LEASE – A six-month authorization of the software purchased. UPGRADE - We value our customers. Should you wish to upgrade your existing license(s) we offer a % value towards your purchase of a new version of the same product. The following definitions serve to clarify the various license types which can be used for the SVOFFICE™ suite. The various Software Authorization Levels can be applied to any of these license types. See the End User License Agreement (EULA) for more details. A Machine License is used to lock an authorization to a specific computer. No physical hardware is used. It is most often used for Software trials. A Portable License is a USB Key licensed to allow a single user to use the Software directly on a specific computer. Remote connections are prevented. The USB Key can be transferred to any computer. A Network License uses a USB Key. This type allows use the Software on a network, allowing the Software to be run by as many simultaneous users on as any computers as the Licensee has purchased seats. A seat represents permission for one (1) user to access the Software from the network at any one time. Our exclusive VIP subscription gives you an All-Access Pass to major new versions and new significant feature additions* for as long as you are a subscriber. *For your currently licensed products and authorization levels only. Prices include free technical support. Annual and semi-annual leases are available. Network licenses are 1.5 times the cost of workstation licenses. Annual VIP-Upgrade is 20% of the MSRP. VIP provided to all customers complimentary first 3 months after purchase. Academic license is provided up to 40% discount of MSRP. Upgrades from SVOffice™2009 are 60% of MSRP. SVOffice™2006 and older versions do not qualify for an upgrade discount. The user can upgrade license level (i.e. From Standard to Professional or 2D to 3D) by paying the difference. Bundles do not qualify for any additional discounts. Academic and Government discounts excluded. Multi-user / quantity discounts are available, please contact us. Please note: SoilVision is happy to consider price matching for any competitive product.